(9 feet) in diameter so it can be easily used inside a lounge. 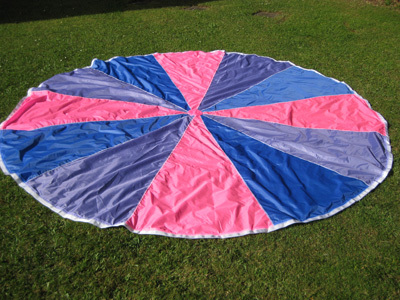 The activity parachute encourages fun, movement, sensory stimulation, group cooperation, social interaction. Just add balloons / beach ball / other objects and music! Includes ideas for parachute games. It is suitable for people who are elderly, frail, have dementia, a visual impairment, can use one hand, are in wheelchairs or seated. $60 each + postage and packaging.To order please contact For A Good Old Age. 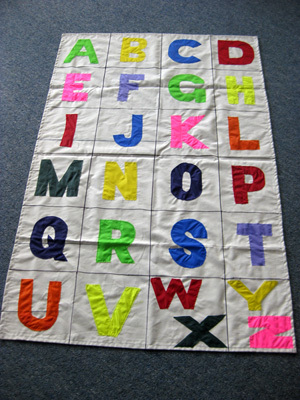 This floor game has bold colourful capital alphabet letters sewn onto thermal drape material and measures 850mm x 1300mm. Simply toss a bean bag onto a letter, think of words relating to the topic/theme and reminisce. This activity encourages physical, intellectual, emotional and social stimulation. For full instructions, see Alphabet Throw in For A Good Old Age 3 on page 52. This activity creates interest, delight, fun and laughter! $25 each + postage and packaging.To order please contact For A Good Old Age. See details of other floor games throughout the four For A Good Old Age books. They are simple and easy to make – just follow the instructions in the books. To order please contact For A Good Old Age. See details of other physical, intellectual and social activities throughout the four For A Good Old Age books. They are simple and easy to make – just follow the instructions in the books. To order please contact For A Good Old Age. See details of calendar themes (those relating to a particular day of the year) throughout the four For A Good Old Age books. They are simple and easy to do – just follow the instructions in the books. To order please contact For A Good Old Age. See details of non calendar themes (these can be used any day of the year) throughout the four For A Good Old Age books. They are simple and easy to do – just follow the instructions in the books. To order please contact For A Good Old Age.